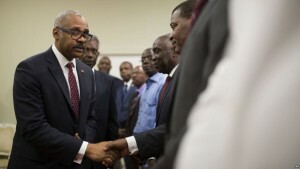 Haitian president Jovenel Moise’s pick for Prime Minister, Guy Lafontant, was approved in the Haitian Senate by a 20-0 vote, with 7 abstentions. This marks his first step forward in pursuit of office, after the Senate confirmation hearing was delayed last Monday. The physician has been criticized for his delinquent tax history; he paid five years worth of taxes only after being nominated. Next, the decision will move on to the lower house, which must also approve the designate before he is to take office. Haiti’s prime minister-designate has cleared the first major hurdle toward reaching office. Jack Guy Lafontant was approved early Thursday in the Senate by a vote of 20-0, with seven lawmakers abstaining. He still has to be approved by the lower house and its 119 members. A date has not been set for the balloting. The Senate vote came at roughly 6:30 a.m. local time, capping nearly 17 straight hours of deliberations about Lafontant’s record and his proposed policies.